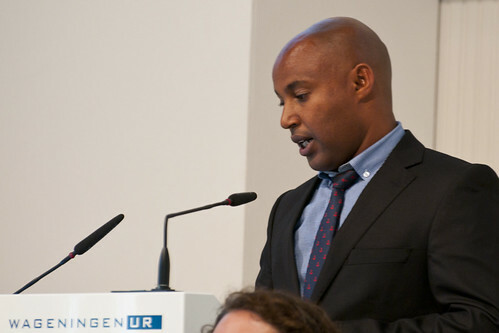 Wondmeneh Esatu of the Ethiopian Institute of Agricultural Research (photo credit: Wageningen UR). Wondmeneh Esatu, a staff of the Ethiopian Institute for Agricultural Research (EIAR) and project coordinator for Ethiopia, introduces himself and his work with the program. It is one of a series of portraits of key people in African Chicken Genetic Gains (ACGG). 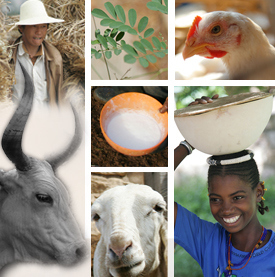 My academic background includes a BSc degree in animal sciences from the Awassa college of Agriculture, a diploma in poultry and animal feeds from Barneveld College, the Netherlands, an MSc in animal physiology from Addis Ababa University and a PhD in animal breeding and genetics from Wageningen University in the Netherlands. I have 14 years’ experience in poultry research and I have served as coordinator of national poultry research at EIAR. My research interests include rural development, village poultry, natural immunity in chickens, disease resistance in chickens, poultry breed improvement, low cost feed formulations and feasibility of breeding programs. I am now serving as a national coordinator for ACGG in Ethiopia. I am involved in the development of indigenous chicken (Horro) as well as synthetic chicken breeds. We plan to further carry out multi-location trials of these lines in various parts of Ethiopia as part of the ACGG project. The idea of the ACGG is very much related to my PhD thesis. What I have done with few farmers in few locations will be carried out in wider areas of the country. I see the project activities as an extension of my study and am very eager to see the outcomes of the project. I am concerned about timely distribution of experimental chicken (growers) to participant farmers and making sure that they build poultry shades as promised. We need to make sure that all of them have constructed these structures before chickens are delivered. A proper plan in consultation with all involved will help facilitate their smooth and timely delivery. The successful implementation of the testing phase will help us identify the promising lines for multiplication and these adapted and preferred chickens will become available for village poultry keepers helping them to produce more eggs and meat. Tags: EIAR, NPC, voices, Wondimeneh Esatu. Bookmark the permalink.